The indications for adrenalectomy were developed before the introduction of laparoscopy. Tumors larger than 5 cm, tumors between 3 and 5 cm with worrisome features or in young patients who would require prolonged follow-up, and functioning tumors are generally accepted reasons to recommend adrenalectomy. 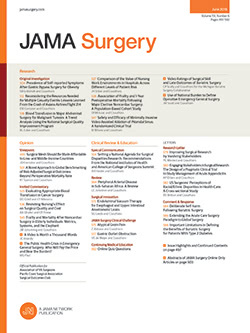 In this article, Henneman and others reviewed their 20-year experience with adrenal surgery to determine whether the indications for operation have changed with the introduction of LA at their center. They conclude that the indications for surgery have remained constant during the study period. However, the authors note a dramatic increase in the number of adrenalectomies performed, from 66 cases to 203 cases after the introduction of LA. The laparoscopic era was further divided into 5-year intervals. An increase from 81 cases in the first 5-year period to 122 cases in the latter period was noted. The authors state that the recruitment of an endocrine surgeon with experience in LA might explain the increase in the latter 5 years. They also note that increased imaging, which has identified more adrenal incidentalomas, and greater emphasis placed on endocrine disease at their center are other possible reasons for the growth.